Have you ever wondered what to do about fairy rings, maggoty onions or scabby potatoes? For nearly two decades, stumped Canadians have been asking garden pro Jerry Filipski these and other tough questions about their gardens, and his well-thought-out answers have appeared weekly in his newspaper column. 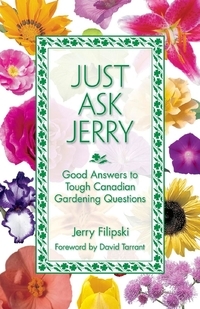 Now Jerry has compiled those questions and answers for the benefit of all perplexed Canadian gardeners. Here's just a sampling of topics covered in this useful volume: * What to do about specific problems such as tomato blossom end rot, mildewy peas, anthills, dew worms, unsightly patches of lawn, browning spruce needles, overgrown trees and cracked trunks * Top ten lists of the best annuals, perennials, trees and shrubs * Best choices for locations that are sunny or shady, damp or dry, plus low-maintenance alternatives * The dirt on soil and how to amend it so that things actually grow in it * Seasonal care and maintenance including pruning, watering, weeding, deadheading, dividing, composting and mulching * Which tools and equipment are handy and which are a waste of time, plus eco-friendly alternatives * Tips on heirloom seeds, raised beds, houseplants and extending the season by growing herbs and vegetables indoors in winter * Includes black and white photos throughout, plus an index to topics covered.